This path was recycled. Can you guess what it used to be? Um, an alien landing strip? Nope. It used to be train tracks. That's why it's so long and straight. People don't use trains as much as they used to so some places have long stretches of tracks that aren't used for anything. 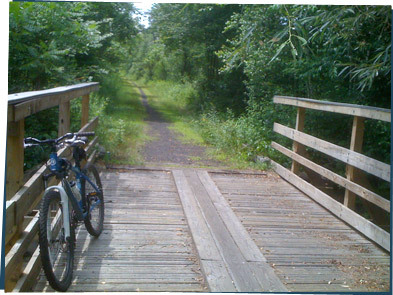 Some of them get recycled into these Rail Trails where people can walk, bike, or roller skate. It's a cool way to reuse this funny shaped space and let people enjoy it!